I could smell my mail from a distance. When I finally got in the house I was shocked to see it was Goat Milk Soap! I brought it out and left it in my drawers for a few days because it made all my clothes smell great, then, sadly, I ran out of soap ( go figure ) so I brought out the goat milk soap. The one I am using now is called Luv Spell which each soap bar is wrapped up in a cloth like bag so it does not stick to anything it just comes right out. The Luv Spell was great it smells so wonderful it reminds me of a tea I drank when I was little. I loved how great of a lather it made and with next to no effort. After showering, my skin felt super soft. I loved it and I could still smell the scent of the Luv Spell. 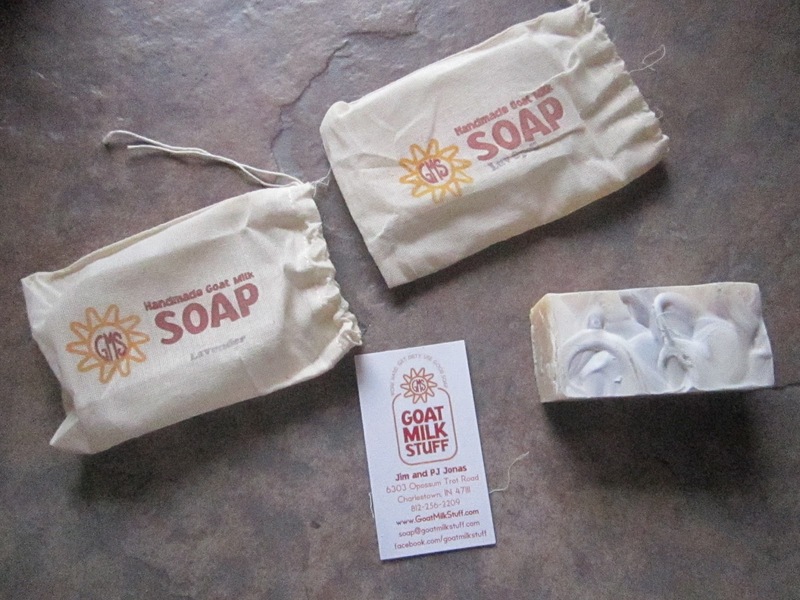 The goat milk soap came from a family run company that is based in IN, the company is called Goat Milk Stuff. The family makes all kinds of goat milk products like the soap, laundry soap, bath bombs, lip balms and even lotion sticks. How cool! lotion sticks! wow my husband would love this because he hates having lotion on his hands. I do as well but I make him give me back rubs. I love that the parents are raising 8 kids in the family business 5 boys and 3 girls. Great smelling, great results soap check out Goat Milk Stuff! Use this link to sign up for the Goat Milk Stuff newsletter and you will receive a 20% off coupon code to try their stuff yourself. Enter to win $25 towards any purchase at Goat Milk Stuff, contest open to U.S. residents only, ends November the 28th 2012. I would like to try the Black Raspberry soap. bars of Kool Koala Goat Milk Soap. I'd like the Lavender Essential Oil Soap. I would love to try the Clean Cotton bar soap. I'd really like to try the Sugar Scrub Cube - Pink Sugary. I'd like to try the Laundry Stain Stick. Thanks for the giveaway. I would try the Variety Set of Small Bath Fizzies. The black raspberry soap log looks awesome! I would like to try any of the essential oil soaps. I like the Lavender Essential Oil bar soaps. I would like to try the Organic Castile Soap Log. I wanna try their Black Cherry Lip Balm. I want to try the Pink Sugary! I'd love to try the Lemongrass Essential Oil bar soap. I want to try their laundry soap and soap scrubs. I'd like to try the Large Bath Fizzy - Pink Sugary.